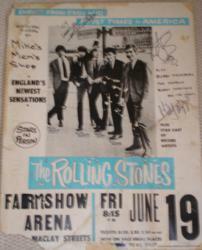 Avid 1960's poster collector Andrew Hawley is seeking vintage Rolling Stones 1964 Farm Show Arena, Harrisburg, Pennsylvania concert posters. The was the second to last concert of the first Rolling Stones U.S. tour. The Farm Show Arena concert was the second to last performance of the Rolling Stones first U.S. tour. Hawley will pay $5,000 cash for the Stones 1964 Farm Show Arena poster or any other 1963 through 1966 vintage Rolling Stones concert poster. Any condition would be accepted. Please call 310-346-1965 or email andrew at vintageconcertposterbuyer.com.